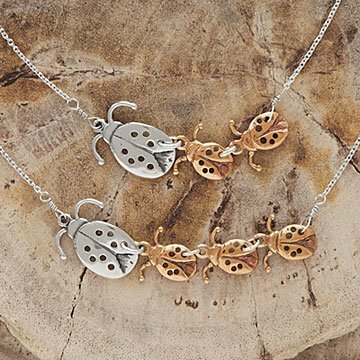 Show mom you’re still her little love bug with this mixed metal ladybug necklace featuring 1-4 baby bugs. Sorry bumble bees, we know you're adorably chubby and covered in fuzz, but when it comes to melting our hearts, another insect is queen. Charming, beyond cute, and symbols of happiness and luck, ladybugs are almost impossible to look at without cracking a smile. That's why maker Trudy James chose them for this mixed metal necklace. Each piece features a big, sterling silver mama and one to four bronze baby bugs. It's a thoughtful gift for the leading lady in your family, or a clever way to show how proud you are of your own little love bugs. Handmade in San Diego, California. Trudy James’ takes the idea of unique style very seriously. Each of the handmade jewelry pieces she creates in her San Diego area studio are one of a kind. Her love of jewelry design began in high school when she took a class in goldsmithing. Today, she combines the techniques she learned with high quality, unique materials from around the world to craft designs inspired by the shapes, colors, details, and asymmetrical balance found in nature. Take a Studio Tour to see where Trudy brings her beautiful jewelry to life. Large Bug: .6" L x .6" W Small Bug: .5" x .5" Chain: 18"
PERFECT GIFT FOR DAUGHTER IN LAW. CELEBRATING THE BIRTH OF THEIR THIRD CHILD. Wife loves her Love Bugs! A beautiful piece of craftsmanship! Really hoping we can add some more baby bugs as our family continues to grow. Glad to be able to partner with an individual artist.